Urgent environmental problems central to national well-being jostle for the attention of China’s scientists as they strive to produce research with global prestige. During a recent visit to the island of Hainan, President Xi Jinping said China should become a leader in ocean science. He was meeting the designers of China’s newest fleet of deep-sea submersibles at the Sanya Institute of Deep-Sea Science and Engineering (IDSE), established by the Chinese Academy of Sciences (CAS) in 2015. IDSE researchers had completed safety tests of the manned vehicle, Shenhai Yongshi, or Deep Sea Warrior, to a depth of 4,500 metres. Underwater glider, Haiyi, meaning sea wings, was just back from an exploration of the Indian Ocean and South China Sea. By 2020, China hopes to send scientists to the Mariana Trench, the Everest of deep-sea exploration, whose lowest depth is 11,000 metres. President Xi’s pronouncement reflects the regime’s growing interest in developing China’s research capacity in Earth and environmental sciences, which has reaped rewards for the country’s production of high-quality research. 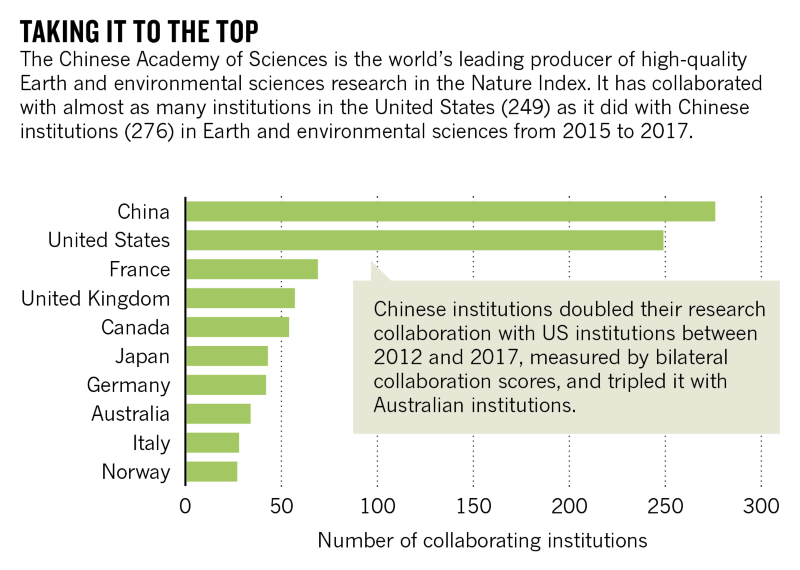 China’s output in Earth and environmental science journals tracked by the Nature Index grew by 95% from 2012 (adjusted to 2017 levels) to reach a fractional count (FC) of 924 in 2017, ranking second only to the United States. Public criticism of central government policies is risky to a career in China. But some quietly worry that the country is focusing too much on strategic research areas that confer global status and prestige, or meet political objectives at the expense of urgent environmental problems that plague the country. These include the impacts of China’s changing agricultural patterns, or heavy metals pollution. The latter, according to Huo Xia, a professor of environmental health at Shantou University in Guangdong Province, is not at the top of research agendas in China because it is not a high-priority problem in the West. Increased funding lies behind the rapid growth in high-quality research output, says Zhang Chengyi, chief scientist for climate change adaptation at the Beijing-based National Climate Center, under the China Meteorological Administration. With an average annual growth rate of 11.2% in the past five years, China’s research and development expenditure reached 1.75 trillion yuan (US$278 billion) in 2017. It accounted for 2.1% of China’s gross domestic product (GDP), a proportion that surpasses many industrial countries, such as the United Kingdom. While the government does not release discipline-level investment figures, Chinese Academy of Sciences (CAS) President, Bai Chunli, in an interview with the official Xinhua news agency in March listed the eight most heavily funded areas, most of which directly concern Earth and environmental sciences: energy, information, materials, space, ocean, life and health, resource and environment, and interdisciplinary basic research studies. Huge resources have gone into research on atmospheric pollution in the Beijing-Tianjin-Hebei area, which has suffered the most from serious haze in recent years. The area, which encompasses China’s capital, and its largest industrial city, is home to 112.8 million permanent residents. A report released by the government in March showed that among the 10 Chinese cities with the worst atmospheric quality, six were in Hebei Province. In January 2017, China’s Ministry of Science and Technology announced that it would invest 2.47 billion yuan (US$386 million) in a programme to study atmospheric pollution and technologies to control it. By September 2017, more than 1,500 scientists nationwide were involved in the programme. Chinese Premier, Li Keqiang has repeatedly said that he will offer a hefty reward to institutions that can identify the mechanism for haze formation. The research has resulted in stronger pollution control policies, and greater understanding of the mechanics of air pollution, including the impact of climate change on pollutant concentration, says Zhu Tong, dean of the College of Urban and Environmental Sciences at Peking University in Beijing. Increased funding is just part of the story, says Yan Hong, a leading young Earth scientist at Xi’an-based Institute of Earth Environment under CAS. Yan points to greater numbers of Chinese scientists returning from training abroad. In 2011 the Thousand Talents Plan, for luring senior scientists home, was extended to promising young scientists. The return of scientists with diverse research interests has widened the range of topics covered in China. 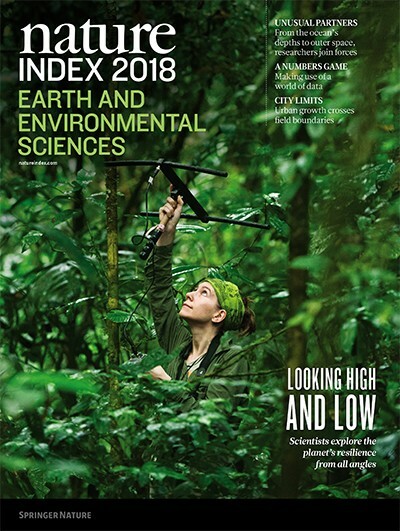 Scientists contacted by the Nature Index listed climate change and its impact (particularly on ecology and corresponding carbon circulation), the mechanism of environmental pollution, geological changes, and oceanology studies as the most significant and productive areas of research in recent years. Chinese scientists have made remarkable contributions to unravelling the complex consequences of climate change for agriculture, according to Yan Jianzhong, a professor in the College of Resources and Environment at Chongqing-based Southwest University, and much of the news is ostensibly good for a nation concerned about its food security. Empirical studies show that climate change boosts China’s heat retention, shortens the frost season, brings the growing season forward and lengthens it. Crop planting areas have been expanded northward and upward on the Tibetan Plateau. Crop yields and planting areas of rice have been greatly expanded. “Few studies have reported negative impacts of climate change on [China’s] agriculture,” Yan says. Whenever Li Hongbin travelled south from Beijing in winter, he noticed the buildings were colder south of the Huai river, which divides China. It gave him an idea. In the early 1950s, the Chinese government started subsidizing coal to fire furnaces to heat homes and offices, but only north of the river, where it is colder. As interiors warmed in the north, the air quality also deteriorated. Li, then an economist at Tsinghua University, realized the disparity offered an opportunity to study the health impacts of long-term exposure to air pollution. Li collaborated with researchers in China, the United States and Israel, to analyse data on pollution and deaths in 90 cities between 1981 and 2000. 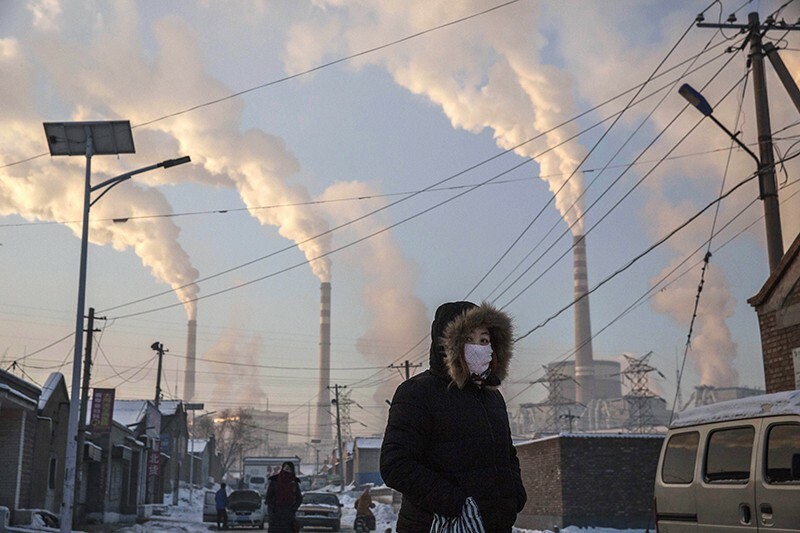 They found that China’s cheap-coal policy cut the life expectancy of northern residents by 5.5 years, amounting to a loss of 2.5 billion life-years over two decades. Their paper, published in 2013, was the fourth-most discussed article that year as measured by Altmetric score, among the Earth and environmental science journals tracked by the Nature Index. It was widely shared on social media by an angry public, who had recently experienced a spike in levels of fine particulate matter (PM2.5), which had covered their towns in a dense haze. The study “educated the public and government officials about the costs of pollution,” says Li, who has since moved to Stanford University. In September 2013, the government introduced a plan to cut air pollution levels, including steps to shift from coal to natural-gas heating in key cities north of the river. Emission standards, including for coal-burning boilers, have also been tightened to match international guidelines. In 2017, average daily levels of PM2.5 in Beijing were at their lowest since 2009. Compared to 2013, when the capital saw 12 days in which PM2.5 levels hit 500 micrograms per cubic metre — a threshold that triggers a red alert — 2017 had no such days. Particular attention has been paid to ocean science in recent years, especially since late 2013 when President Xi revealed the Belt and Road Initiative to build a China-centric trading network in Eurasia, including a so-called 21st Century Maritime Silk Road, which traverses the South China Sea, the south Pacific Ocean and the Indian Ocean. 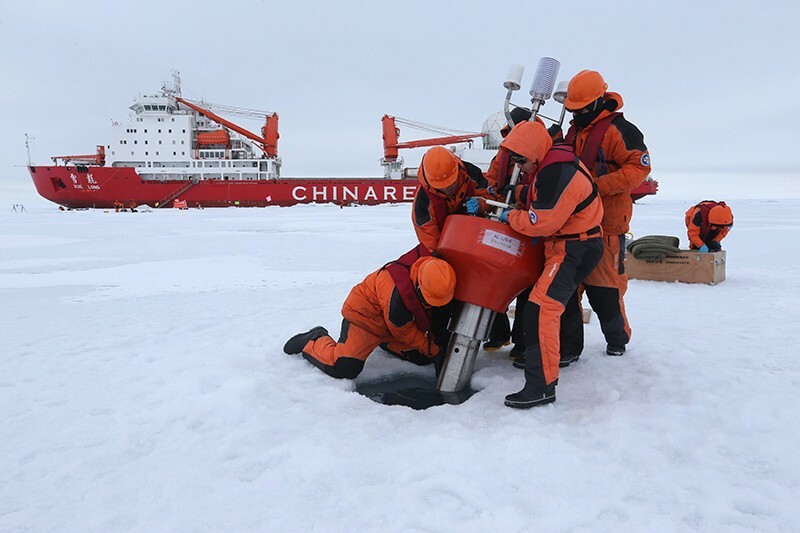 China has dispatched dozens of scientific surveys covering the polar regions, the Indian Ocean and the Mariana Trench. The deep-sea research submersible Jiaolong, which means dragon, claims the greatest depth range of any manned research vehicle in the world, to 7,000 metres. The Guangzhou-based CAS South China Sea Institute of Oceanology, recorded an almost 370% growth in its authorship of papers in Earth and environmental sciences in the index, measured by FC, and has been funded to lead several key national ocean studies programmes. Universities that don’t already have schools or research centres for ocean studies are rushing to set them up to take advantage of the funding and prestige on offer. Despite growth in the field, an ocean scientist who asked not to be identified for fear of offending his colleagues worried that the incentive to publish in high-impact journals has skewed research towards areas with short-term visible returns. “Basic research needs long cultivation. Can the explosion in high-impact papers in a few years truly reflect progress in science?” the researcher asks. He is echoed by Zhang: “Most of our studies follow the hot research directions raised by Western scientists. Only by following them can the high-impact papers be published.” Despite the significant output growth in climate change-related studies, “It is unlikely that Chinese scientists can find and lead the most useful research directions in the next five to ten years,” Zhang says. He notes, for example, that Chinese scientists have been mostly minor co-authors on research cited in reports of the Intergovernmental Panel on Climate Change. While Chinese scientists have made breakthroughs in Tibet-related climate research, their work in other areas, such as tropical and polar research, often follows directions set by their Western counterparts, Zhang says.